In the 12 months ending April 2017, there have been 61 overall traffic fatalities in Queens, down 34% from the 93 people killed in 2013, the Vision Zero benchmark year. Citywide, there has been a 20% decline in fatalities. Injuries. 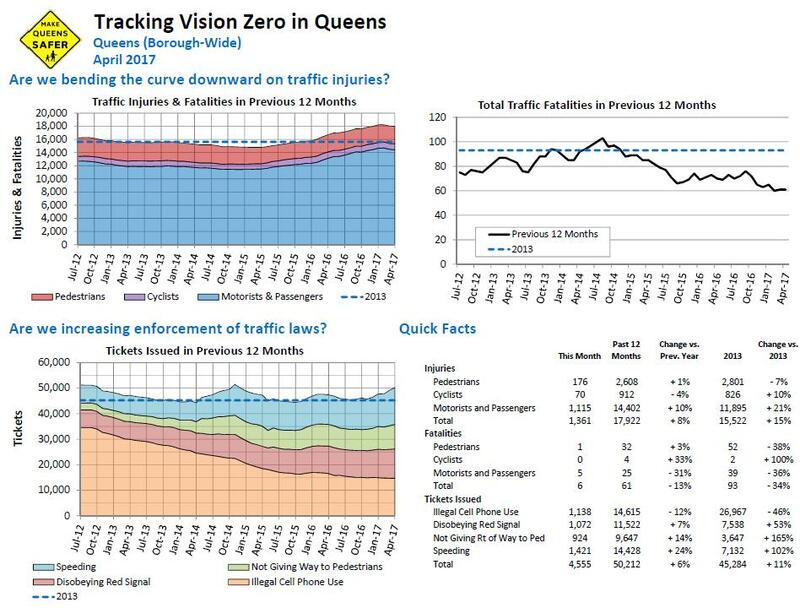 In the 12 months ending in April 2017, there have been 2,608 pedestrians injured in Queens by motor vehicles, a decline of 7% from the Vision Zero benchmark year, 2013. In the same time, there have been 912 injuries to cyclists, a rise of 10% since 2013. Overall, including motor vehicle occupants, there have been 17,922 people injured in motor vehicle crashes in Queens over the past year, up 15% since 2013. Citywide, there has been a 7% increase in injuries over this time. Across the city, there has been a general upswing in injuries from vehicular crashes in recent months, a pattern that is seen across every borough. Part of this is likely due to an underlying citywide increase in traffic and pedestrian activity. But this contributing factor notwithstanding, Queens has seen the greatest percent increase in traffic-related injuries of any of the five boroughs. Enforcement. Overall, while enforcement of speeding, red light running, and not giving right of way to pedestrians remains significantly higher than pre-Vision Zero levels, tickets issued for illegal cell phone use, an important contributor to distracted driving, remains sharply down. Overall, enforcement across all four categories in Queens is up 11% since 2013, the lowest of all of the boroughs. Citywide, enforcement is up 25%. Back at the beginning of the school year, the city promised a surge in enforcement efforts to protect pedestrian safety. Boroughwide, there has been an uptick in enforcement actions over the past six months. , but the pattern is not seen in every precinct. Communities with a significant increase in tickets issued over the past six months include the 100, 102, 105, 108, 109, 110, 111, 112, 114, and 115 precincts. ← We’re paving the road for family biking.